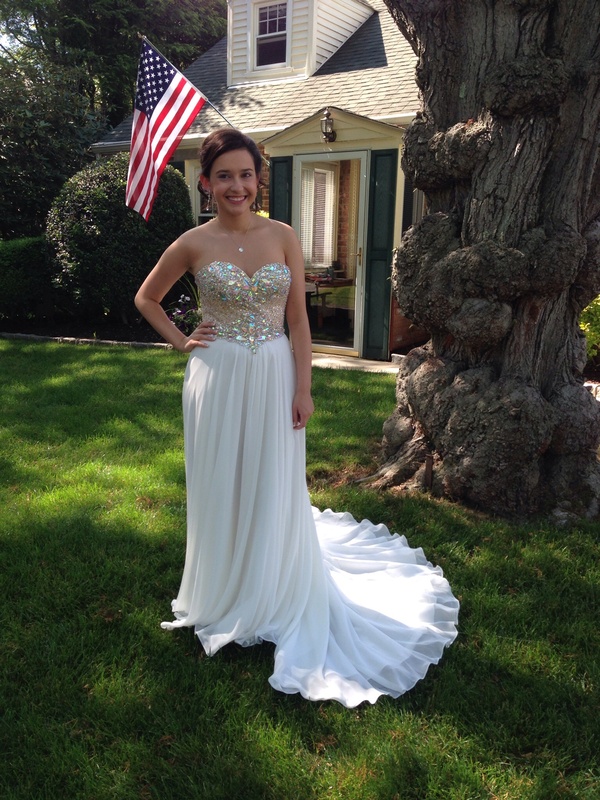 What a weekend as Catherine’s prom and the 70th anniversary of Port Chester, NY’s Band Night/Blue Key Celebration collided. It was great — if exhausting — fun. I may need a few more days to recover. Friday night and Saturday found me much as I might have been 30+ years ago, practicing music and revisiting personal connections. The Band Night weekend brought together PCHS musicians from back to the 1940s up to present day for a couple days of making music. Here we are on stage, photos shared by the conductor, Carolee Brakewood. Among the musicians on stage were members of the Rye Town Community Band, many of whom are PCHS band alums. I’m in here, I promise! What fun to have the chance to play with my clarinet teacher; my elementary school music teacher; and various classmates and folks I looked up to over the years. 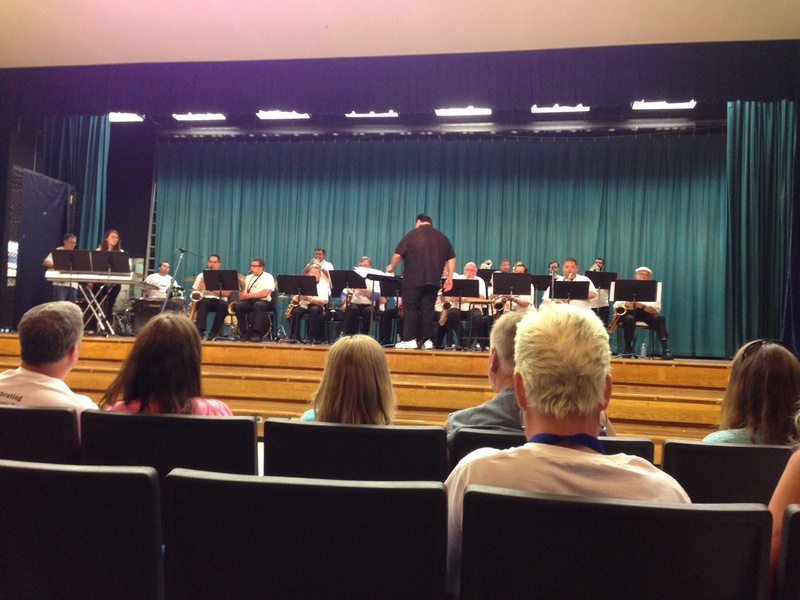 We had two performances: Concert band Saturday afternoon and band night Saturday evening. It was a blast. Here’s a clip of our finale, “Stars and Stripes Forever,” shared on YouTube by band member Marc Arnel. The Jazz Band blew the walls off the auditorium. While I was playing my way through yesteryear, Basil was earning extra-duty pay playing Dad AND Mom. He supervised the hair salon visit, picked up the bouttonniere for Catherine’s date, and hit the front lawn with the leaf blower so it would look nice for the pictures. I popped home between concerts, zipped Catherine into her dress, strapped her into her silver sandals and watched a breathtaking transformation. Naturally, we had to show off the train. Catherine and Phillip, ready for prom. 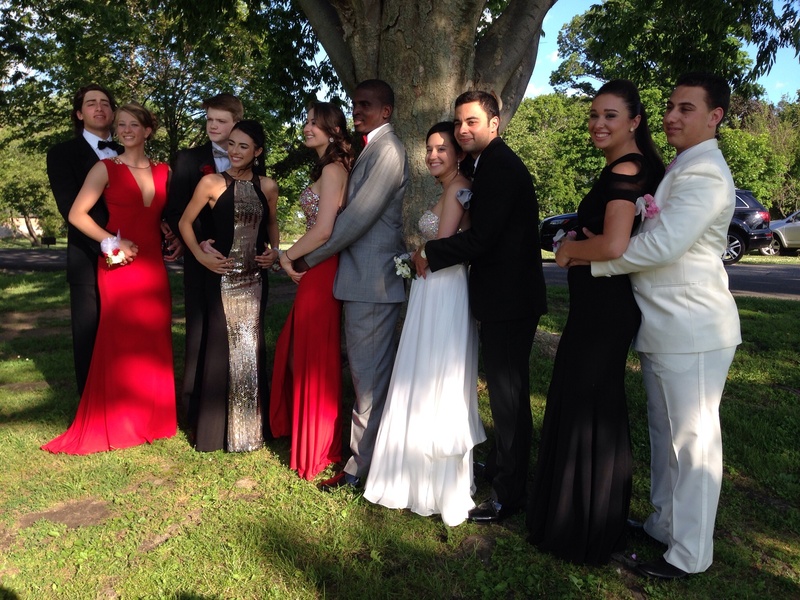 Her circle of friends gathered at Tod’s Point in Greenwich for one set of photos, then hit Binney Park for another round before heading to the Greenwich High prom. There, we kissed her goodbye and raced back to Port Chester, me assembling my clarinet as we sped down I-95 lest I be late. Back on the field at Ryan Stadium, the years melted away as that familiar drum cadence sounded and we stepped off on the field. The stands were packed with cheering crowds, eager to hear the Pride of Port Chester. Basil missed the chance to snap still photos or film our earlier numbers, but managed to catch the finale, played with the current high school band. There, for a brief few minutes, I was 18 once again, wishing it wouldn’t end. 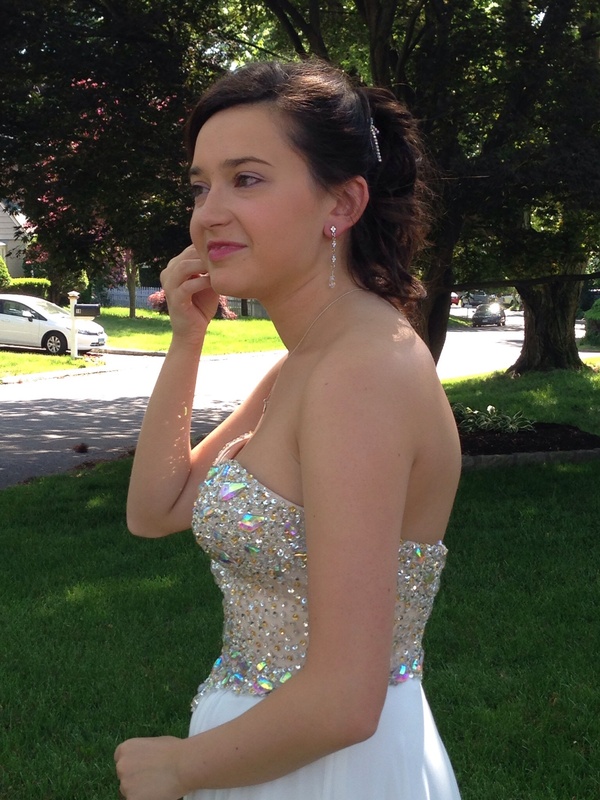 Like everything in life, your blog posts, beginning with Catherine’s last year in high school plus your blog post last week, The Waiting Began, (who in their right mind enjoys the waiting period; I sure didn’t lol),for me anyway, to finally get a glimpse of “that dress”. What a beautiful woman Catherine has become and a beautiful dress to truly show her off!! Oh, and your concert was lovely. what a wonderful weekend. oh to be 30 again! hope you and basil don’t need more than a few days to recover from all the excitement. congrats!